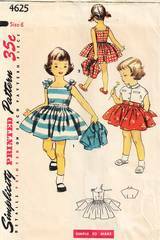 Original vintage sewing pattern from 1954. Dress has fitted bodice with square neck and back button closing. Skirt is softly pleated. Tie ends may be sewing into side seams to extend to make a back bow. Jacket with kimono sleeves has a small collar and a three button closing. Girls Size 6, Breast 24, Waist 22, Hip 26. Pattern is complete. The pieces have been very carefully cut and folded. Envelope and contents are all in good condition.